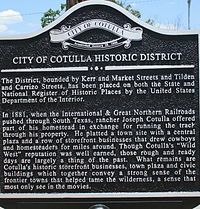 Cotulla is located at 28°26′3″N 99°14′11″W﻿ / ﻿28.43417°N 99.23639°W﻿ / 28.43417; -99.23639 (28.434144, -99.236343). This is 81 miles (147 km) Southwest of San Antonio, Texas. According to the United States Census Bureau, the city has a total area of 2.0 square miles (5.2 km2), all of it land. The Nueces River flows through southern Cotulla in a southeastward direction to the Gulf of Mexico near Corpus Christi. As of the census of 2000, there were 3,614 people, 1,208 households, and 901 families residing in the city. The population density was 1,831.8 people per square mile (708.3/km²). There were 1,504 housing units at an average density of 762.3 per square mile (294.8/km²). The racial makeup of the city was 83.45% White, 0.64% African American, 0.39% Native American, 0.50% Asian, 12.67% from other races, and 2.35% from two or more races. Hispanic or Latino of any race were 83.56% of the population. There were 1,208 households out of which 39.0% had children under the age of 18 living with them, 52.7% were married couples living together, 17.8% had a female householder with no husband present, and 25.4% were non-families. 22.6% of all households were made up of individuals and 11.8% had someone living alone who was 65 years of age or older. The average household size was 2.95 and the average family size was 3.50. In the city, the population was spread out with 33.6% under the age of 18, 8.6% from 18 to 24, 24.0% from 25 to 44, 21.3% from 45 to 64, and 12.5% who were 65 years of age or older. The median age was 32 years. For every 100 females, there were 90.2 males. For every 100 females age 18 and over, there were 87.2 males. The median income for a household in the city was $23,250, and the median income for a family was $25,951. Males had a median income of $21,199 versus $17,415 for females. The per capita income for the city was $10,856. About 27.9% of families and 30.1% of the population were below the poverty line, including 39.0% of those under age 18 and 28.1% of those age 65 or over. The Brush Country Museum in Cotulla preserves regional history. The First Baptist Church of Cotulla was established in the 1880s. The current sanctuary opened in 1948. The La Salle County Courthouse in downtown Cotulla has undergone extensive renovation. Cotulla is within the Cotulla Independent School District. Cotulla High School, with grades 9-12, is located east of town. The modern structure is divided into several noncontiguous units. Cotulla has Roman Catholic, Southern Baptist, United Methodist, Presbyterian, and non-denominational churches. The Presbyterians and Baptists originally shared the Methodist facilities, which began in 1881. New Methodist buildings were constructed in 1906 and again in 1928. In 1883-1884, the Reverend W. D. Johnson organized a Baptist fellowship in Cotulla. After several years of meeting at the Methodist Church, the first Baptist building opened in 1889, with the minister John Van Epps Covey (1821–1898) preaching the first sermon in the new structure. The current church sanctuary on Main Street opened in 1948 under the leadership of the Reverend Jesse Cooke. The new First Baptist pastor in Cotulla as of 2013 is Loren G. Fast. Prevailing Word Church, located in a new sanctuary at 419 South Main, had co-pastors in 2009, L. Lynn Beams and Abram De La Garza. It has services at 3 p.m. Sundays, rather than the customary morning hours, and mid-week services on Thursday evenings, instead of Wednesday. Josh Beckett, pitcher for the Los Angeles Dodgers, owns Herradura Ranch, a 7,000-acre (28 km2) deer-hunting enclave located approximately 28 miles (45 km) from Cotulla. Jeff Bezos, founder and CEO of Amazon.com, and the wealthiest person in the world, as of December 2017. His maternal ancestors were settlers who lived in Texas. Over the generations, the family acquired a 25,000-acre (100 km2) ranch in Cotulla. George Strait, a cousin of Jeff Bezos (see above), has a ranch near Cotulla. John Lewis Gaddis, known as the "Dean of Cold War Historians", was born in Cotulla in 1941. U.S. President Lyndon B. Johnson taught public school in Cotulla in 1928–1929. Ray Keck, fifth and current president of Texas A&M International University in Laredo, was reared in Cotulla, where his father, Ray Keck Jr., was a president of the Stockmen's National Bank prior to 1967. O. Henry, the short story writer, lived on a sheep ranch near Cotulla in the early 1880s with the successful goal of improving his health in dry climate. Kevin Patrick Yeary, incoming judge of the Texas Court of Criminal Appeals, was born in Cotulla and raised in Laredo. Phil Lyne, a former rodeo cowboy and 1979 ProRodeo Hall of Fame inductee resides in Cotulla. ^ "How to Pronounce: C Cities". 23 September 2014. ^ "La Salle County, Texas". quickfacts.census.gov. Archived from the original on July 13, 2011. Retrieved June 29, 2013. ^ Leffler, John. "Cotulla, TX - Handbook of Texas Online". Texas State Historical Association. Retrieved 24 May 2011. ^ Glenewinkel, Jay. "Missouri Pacific Disaster in Cotulla, Texas 1973". trainweb.org. Retrieved 24 May 2011. ^ "Prevailing Word Church". americantowns.com. Retrieved January 3, 2009. ^ "Jeff Bezos' roots could give Texas an edge as Amazon.com looks for new HQ site". Puget Sound Business Journal. September 7, 2017. Retrieved January 19, 2018. ^ Caro, Robert A. (1982). The Path to Power. The Years of Lyndon Johnson. New York: Alfred A. Knopf, Inc. pp. 164, 174. ISBN 0394499735. ^ Mahoney, Sylvia Gann (2004). College Rodeo: From Show to Sport. Texas A&M University Press. p. 97. ISBN 978-1-58544-331-4. 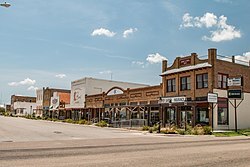 Wikimedia Commons has media related to Cotulla, Texas. This page was last edited on 12 January 2019, at 21:38 (UTC).